The Starchild Skull: - Interesting New DNA Results. Ok the starchild skull has been around for a while, there have been many theories about how it came about i.e. alien, alien human hybrid or deformed child. But if this analysis is correct and true then maybe we are a step closer to discovering the truth about the origins of the star child. For those of you who do not know about the starchild skull, I will go through the back ground of the skull. The skull was found in 1930 in a mine approximately 100 miles from the city of Chihuahua, Mexico. It was found next to an exposed normal human skeleton lying in a supine position. 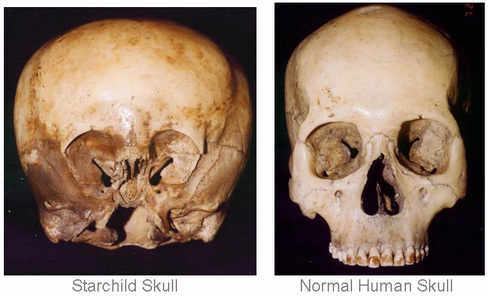 Test on both the normal human skeleton and that of the starchild skull shows that they are approximately 900 years old. The skull had been passed through various owners over the years until it came into the hands of a paranormal researcher by the name of Lloyd Pye in 1999. Lloyd Pye claimed that the skull was that of an alien human hybrid and has had various DNA analysis carried out on the skull. The latest preliminary results form the DNA analysis claim that the star child is an Alien born to a human mother!